I was in two minds on getting this pack, I’d seen it on racing snakes and I AM NOT a racing snake. Traditionally I’ve been a mid packer but across the boards from club runs to Ultras I’m steadily making my way up the field. So the pack arrived from www.outdoorwarehouse.co.uk and weighed a mere 500g with the two supplied bottles. Today I packed mine with my full waterproof kit, spare base layer, L50 maps & road book, hat, gloves, 1st aid kit, food, 1500ml of water, trekking poles and two head torches and my Leatherman Style CS multi tool. This lot came in a 4120 grams. 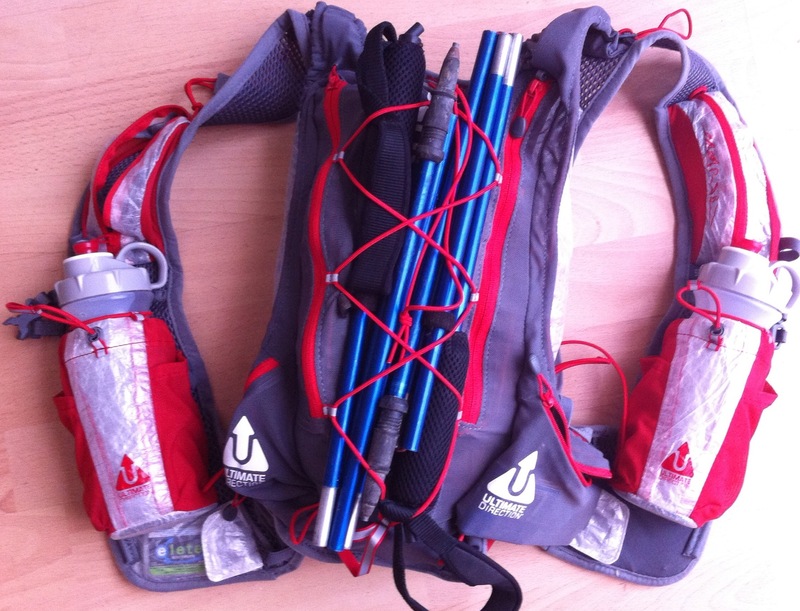 The pack has two chest straps, one lower than the other and as you add kit in this makes these tighter. I’m not built in the way these straps are meant to be worn but whilst running I played around with them and there seemed little difference irrespective to how I wore them. They slide up and down to micro adjust as to how you want it to fit but I felt little bounce with two or just one done up. The bottles on the chest are great for easy access, the water sloshes around a bit but I’m used to this from the iGammy on my OMM packs. This also makes re filling on the go so much easier and administration of things like elete or High5 tablets. I tend to carry one water bottle & one laced with electrolyte! I didn’t experience it as I wasn’t out long enough but you may want to watch the weight distribution as you drink your water. I took from the right all the time which put all the weight on the left. Might be an issue but that’d be the same with all systems of this type. There are also many other front pockets as well as the bottle pouches that make grabbing food easy on the go. Additionally there are a number of little pockets for my electrolytes, cash and others for iPhone, compass and GPS etc. iPhone 4S fits, be surprised if the iPhone 5 goes in! On the ‘wings’ there a couple of zipped pockets which likely i’ll use for more food and the are also a pair of velcro fastening bellows pockets that took an extra bottle of water today. These would take a waterproof or other items you may want to be taking on and off without removing the pack, hats/gloves etc. On the rear are two pockets, one that took my waterproof pants, maps, 1st aid kit and hat, gloves and base layers. There was still plenty of room for more food and can also take a bladder if you wanted and can be secured by the internal compression. 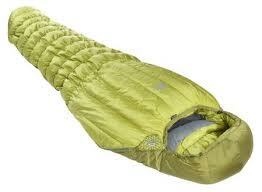 This is partly made from a cuben fibre material that’s very very light and almost impenetrable. It’s the material used on sails for modern day racing yachts and you’ll find this on the front pouches and another couple of pockets too. The other pocket is an expanding mesh and seemingly you can just keep stuffing items in here. My waterproof smock went in and head torch (unlikely as i was to require this on a Friday afternoon) and also had more room if required. Further to this was the webbing bungee where I fixed my mountain king trekking poles. I didn’t need to use the specific pole loops nor did I take my ice axe on this occasion so this loop wasn’t used either. There was zero movement or rattle from the poles and until I was confident I kept checking to make sure these hadn’t fallen off. They didn’t fall off and nor are they ever likely to!!! There are plenty of other elastic loops (4+) to pull buffs through or rolled maps etc. you won’t be short of where to stash stuff and actually be able to use it!! The pack once on can be compressed by the internal bungee which has a single pull on the right shoulder which helps stabilise further. There are two additional bungees to pull closer still above the wing pockets too. I ran on an off road trails, some hard packed and also some road. I tried some fast paced intervals and bolted down some sharp descents to try and get the pack to roll or rock around. It didn’t, wouldn’t and likely never will!!! I didn’t get any rub from the wide shoulder straps nor any back rubbing which given the temperature and amount of sweat being produced I was very pleased with for its first go. I also didn’t get the irritating T-shirt rise either like I have with other packs. Having plenty of high vis points and a fixed whistle the pack is sure to keep you safe on trail and road too. This really is fantastic piece of equipment and if I was half a stone lighter or more then it would be better still. Despite my build for endurance and not for speed I felt the benefits of this regardless of my frame. It will only get better! Bottle holsters can carry 26 oz. bounce and the vest expands as you need it to. Want one, then speak to Charlie at the Outdoorwarehouse to get your pack shipped…. A recce of two halves…..
Sunday 14th April saw a very early start to meet the rest of the crew at Hawes which we only just made. After a near head on collision with a VW Golf coming toward us very much on the wrong side of the road was maybe just a sign of things to come……well read on. Upon our arrival at Horton the weather was overcast with a breeze and all was looking good. More astonishment at the car park charges, this time £4.00, but more still more than agreeable for a good day out and a bit like a buy one get one free but across the border. So which way, amazingly the 1st place we went was to the pub, well the car park of the Crown to where we picked up the Pennine Way. These were to be out first tentative footsteps of what will be our 108 mile epic in January 2014. We made or way along the Pennine Way and the route which is well signposted and good underfoot all the way to Birkwith Moor and the edge of the forests. We crossed a stream or two and despite having waterproof socks on I was ridiculed for leaping these to ensure I kept my feet dry. We’d been doing some good map reading tests along the way following our navigation session with Charlie Sproson, Director of The Outdoor Warehouse, to ensure we knew where we were and paying much needed attention of our surroundings, height and picking up locations across the valley to make sure we worked our timing out from point to point. We could see the snow capped iconic Yorkshire 3 Peaks, Ingleborough, Pen-y-Ghent and Whernside. We were also able to see the weather that was chasing us along our route, it didn’t look good. Our pace was good and Crossing Sike Moor to join with the Dales Way we made great progress up Oughtershaw Side and on toward Dodd Fell. It was here the Cumbrians made good decisions and donned full waterproofs. I was sporting a couple of base layers and my new Montane Minimus Smock (review to follow), full length A400 Skins, waterproof socks with Injini liners and my Inov8 295’s. Despite the fact that the wind had whipped up to what felt like gale force and the rain had started I was still toasty warm and didn’t feel I needed my waterproof trousers which were in my pack. 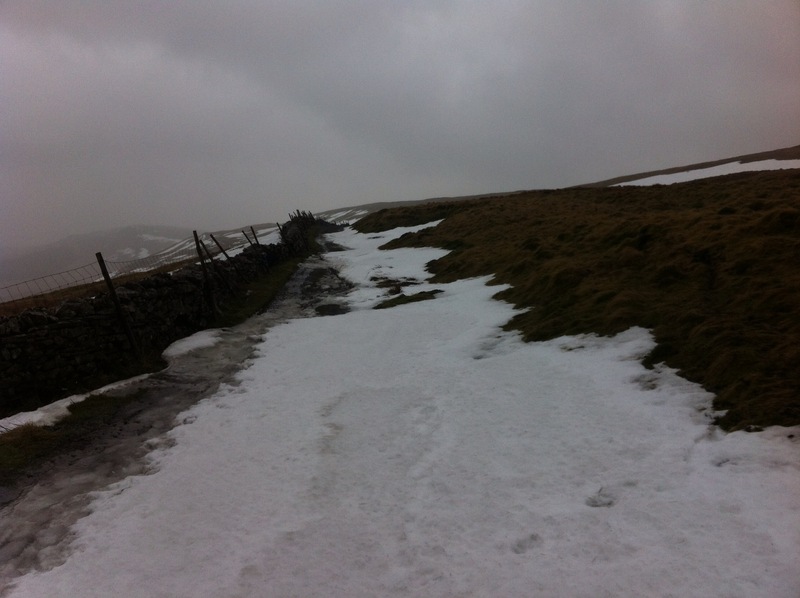 As we followed the track under the summit of Dodd Fell we had to negotiate to snow drifts that were covering the track. In places we were knee deep and underneath was either ice trying to bring us down or deep freezing puddles. I had my Kahtoola spikes in my pack but these wouldn’t have been much use as they would have clogged up with the snow being very wet as now the rain which was near horizontal was turning to hail and was making things pretty miserable. A couple of slips on the ice jarred a few muscles trying to stay upright, much to the amusement of the rest of the boys, and battling our way through the drifts was using all our muscles. This went on for around 2/3 miles! Working our way along the track towards Ten End seemed to take and age only to be made much much worse by my lace loops snapping causing my shoe to start working loose. I had spare laces in my 1st aid kit and also as a lanyard for my compass (just in case) but on this occasion this wasn’t the issue and the only thing that would have worked was duct taping my shoe to my foot had it got any worse. Note to self wrap some around my bottle just in case!!! So the rain, which had now got even harder and colder had run down my jacket sleeves and soaked my gloves, it was also so loud on my hood despite my hat that we were unable to hear one another over the noise. As we topped out at Ten End and crossed Sleddale Pasture I stopped to put on my Berghaus Vapour Storm jacket. For once id acted before I needed to, more as prevention on this occasion, as I was still quite warm but there was zero let up in the rain and I wanted to make sure I didn’t start to get cold. Wayne reminded me to eat here and I popped another chunk of Chris’s amazing Granola! What id noticed was that despite my waterproof socks my feet felt very wet. What I hadn’t noticed is that the fierce rain/hail had saturated my skins and was running down my legs, into my socks and in turn was filling them up! Even worse tho was I had bloody cankles! Now this is an ongoing discussion amongst the Ultramadness team and I was happy to be proved wrong in saying that the waterproof socks/shoes are great, until you get water in them! Water can get in from crossing a river and going over the top of the socks and it being unable to escape, this can cause all sorts of issues if this is for a period of time. So now I was running in a loose shoe and waterproof socks with a pint of water in each that had run down my saturated skins! BRILLIANT!!! Now had I put my waterproof trousers on there would have been no issue at all but as I wasn’t anywhere near cold I simply didn’t feel the need. Even when I stopped to put my GORE-TEX jacket on putting on my over trousers hadn’t even crossed my mind! Never would I have thought my socks were going to fill with water in such a fashion so less an error more something to think on for next time! So on we went descending into Hawes. The pasture was very wet and extremely slippery. Normally a fun trot down but my loose shoe was causing my foot to move in my wet sock and cause an issue. I knew we had maybe 3km to go at this point so we cracked on but any longer would be an issue for sure. Chris had hit the deck 3 times coming down the descent. Fortunately he was able to control these and not aggravate his dislocated shoulder from a trot in the Lakes earlier in the year where he’d slipped on the ice coming down Red Pike above Buttermere in January! We hit the road and the slipping in the shoe was starting to takes its toll and I felt some blisters forming. Having run down the hill with less coordination than usual had also started to worsen a lower back issue, thankfully only a dull ache was to be the issue! A trip to my Chiropractor to line me back up before our training starts proper is likely required to make sure this doesn’t get any worse, especially as we’ll be carrying so much more weight on the Spine! We made it back to the car and changed into some warm clothes. My socks were emptied and a ridiculous amount of water was in them. Jury’s still out on this one boys but ill be giving them another go but im really not sure! This recce had been really valuable for a number of reasons. My base layers, a Rab AEON ls t-shirt, Montane Bionic t-shirt and Montane Minimus Smock had worked brilliantly with gloves and hat. I’ve been happy with my Skins and shorts for a while now but I’ve still to sort my socks out yet! I made a sensible decision in putting on my GORE-TEX jacket before I’d needed too and the rain running into my socks was something id never ad even thought about so this had been a valuable lesson! Would anyone else have expected this? I also had a spare thermal base layer in my pack had I needed it and my RAB Generator insulated smock so things are looking good as to finalising my kit for the Spine Challenge proper! Spare gloves, waterproof, and a spare hat and im pretty good to go in the clothes department. 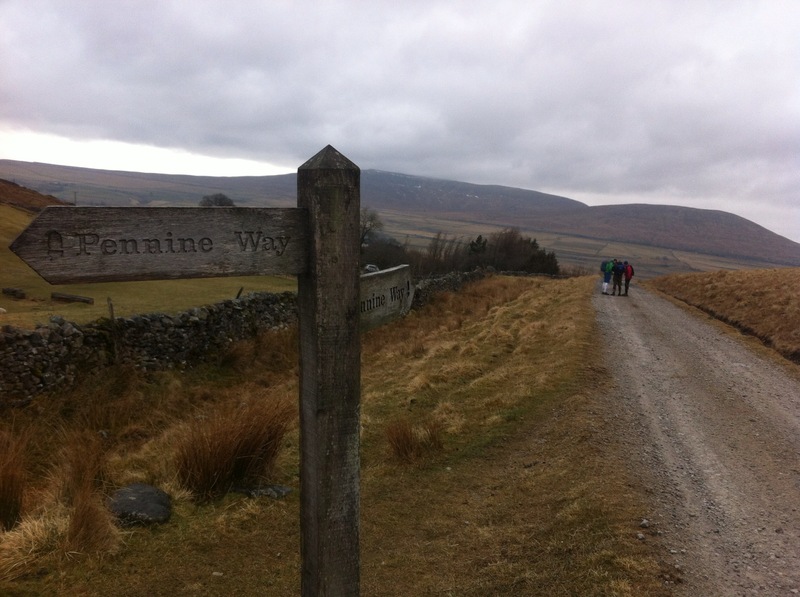 We’ve a recce from Edale – Wessenden Head planned for the end of April so more fine tuning im sure but all in all a very eventful but invaluable first recce. Next time we’re on this leg we hope to be finishing the Spine Challenge. It will be very dark, likely we’ll be ridiculously tired, and I suspect very emotional and willing our bodies the last 14 miles to Hawes! With the 60hr limit we’ll be aiming to crack on thru the night(s) but should we encounter any difficulties and have to stop this with be invaluable along with our survival bags. With a sleeping bag able to cope with these temps (on the 2013 running it got as low as -16) inevitably this adds bulk & weight, unless you send a fortune! Having stumbled across the Mountain Equipment Extreme Range it appears this might have to be the case. I’ve been eyeing up the Lightline Lightweight from Mountain Equipment which is a year round bag with a sleeping zone of +10 to -9 (extreme temp down to -22) weighing a tidy 1,215g and packing reasonably small. RRP is £350 but like a true Yorkshireman I’ve found this for less than half that!